A lot of great things were introduced in the ’80s – McDonald’s began serving Chicken McNuggets in 1981; The Breakfast Club hit the big screen in 1985; Bon Jovi’s “Livin’ On A Prayer” was released in 1987; and cellphones weighed as much as 20 pounds! 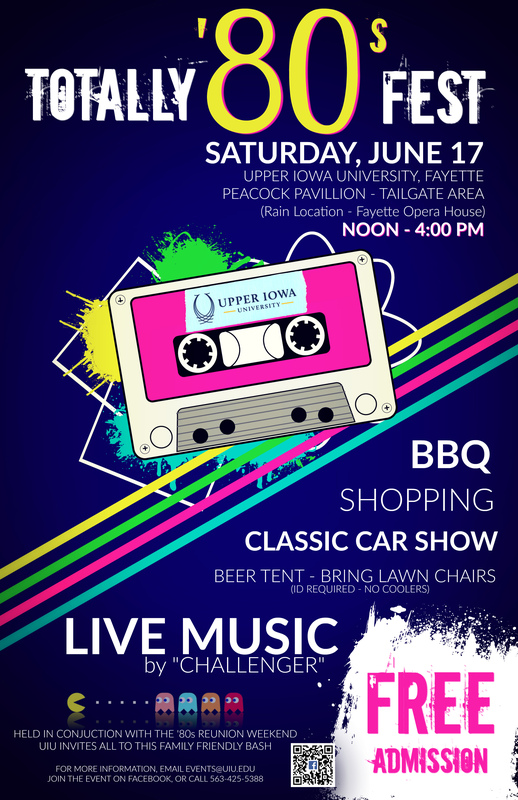 The public is invited to relive those memories and more when Upper Iowa University hosts Totally ’80s Fest Saturday, June 17. The activities will be found at the Peacock Pavilion tailgate area (adjacent to Harms-Eischeid Stadium) in Fayette from noon to 4 p.m. In addition to a retro photo booth and Show & Shine Cl assic Car Show, the free entertainment includes the ’80s cover band, Challenger. All classic car owners are invited to line up their vehicles for the event between 11-11:45 a.m. For additional Show & Shine information, contact Lloyd Carnicle at 563-422-1817. Bring your lawn chairs and enjoy the entire family-friendly event. Local food and merchandise vendors will be on the grounds. No coolers will be allowed. In case of inclement weather, the celebration will be relocated to the Fayette Opera House. Join us on for the Totally ’80s Fest to relive and reminisce this decade. Contact the UIU Alumni Office with any questions at 563-425-5388. We hope to see you there! This event is held in conjunction with UIU’s ’80s Reunion Weekend Friday, June 16- Sunday, June 8, at Fayette Campus. For additional information or to RSVP, Peacock graduates of the ’80s are invited to click here. Persons may also contact the Alumni Office with any other questions at 563-425-5388.